Judæo-German actor; born at Odessa, Russia, January 1, 1855. Influenced by a Jewish troupe which came from Rumania to Odessa in 1875, he resolved to devote himself to a theatrical career. He made his first appearance in 1878 at the theater in Kherson, Russia, and from the outset proved himself a skilful interpreter of the sentiment and thought of the Russian ghetto. In 1883, when the Russian government prohibited all Jewish plays, Adler emigrated to London. 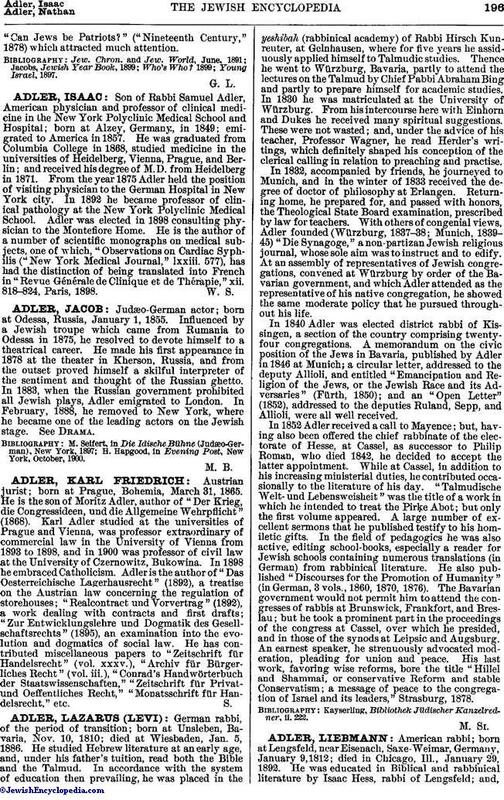 In February, 1888, he removed to New York, where he became one of the leading actors on the Jewish stage. See Drama. H. Hapgood, in Evening Post, New York, October, 1900.